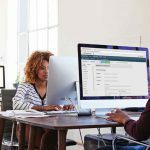 Most workplaces face constant change—from seemingly minor matters such as choosing new computers to major ones such as implementing new personnel policies. The question of how to drive that change, though, is one of never-ending complexity. Human Resources (HR), a traditionally paper-heavy department that depends on document-driven processes to get work done, is a department that must drive significant change. Like many HR departments, The United Arab Emirates Ministry of Human Resources & Emiratisation (formerly known as the Ministry of Labour) was searching for a more efficient way to manage HR processes. The ministry had attempted to digitize its archived files, but the difficult-to-use solution sat untouched. 1. Evaluate the Options: Reinvest, Reinvent or Replace? When you’re building a business case, you’re not just persuading others to support your efforts. You’re generating, analyzing and evaluating ideas in a disciplined way, which enables your leadership team to make a wise investment decision. Here are the three most important questions to ask before you start looking at specific document management systems. Managers, HR professionals and applicants all benefit from a more efficient hiring process. Keep in mind that even when you get a “yes,” your job is only half done. You’ve sold the idea up and across—now you need to sell it to the people who will be using it. Stakeholders can say yes—but it’s the people who use the technology who most often say no. If you’re the boss, you can order change—although that doesn’t always achieve the desired result. The heart of change management methodology boils down to talking with affected employees. People are more inclined to work with a process when they feel that they have been included in the decision to switch to that process. “The readiness of both the management to support the change and affected workers to accept and adapt to the change are the most crucial factors in the success, or failure, of your project,” notes AIIM. The ministry expected pushback from users, but was pleasantly surprised at their reaction. “There were a few complaints at first, but mostly people took well to the new system,” Zarouni says. “Once things were set up in the beginning, it suited the users’ requirements and only minor questions came up. Those were accommodated quickly,” concurs Ahmad Al Nasser, the ministry’s Director of Information Technology. For more information on how the IT department managed change, download a complimentary video about the ministry’s approach to managing HR documentation . To build on initial successes, Rachel Cotter Davis, Ph.D., an expert in change management and organizational transformation, advises that once employees engage with the new solution, leaders should look ahead to future improvements building on the change that has been implemented. For HR departments, business process automation provides a rich opportunity to extend success, as automating traditionally manual processes like recruiting and onboarding new employees, evaluating employee performance and processing leave requests can increase productivity and cut costs. An example of how to diagram an HR process. Rather than pushing a system on every department and running into resistance, the ministry’s IT Department waited for a successful pilot to spur other departments to ask for the new system. What began as a pilot program in the human resources department has now expanded into the IT, administration, finance and legal departments, contributing to improvements in contract management and client services. To learn more about the ministry’s approach to taking document management enterprise wide, download this short case study. Want to learn more about how to drive change in your HR department? 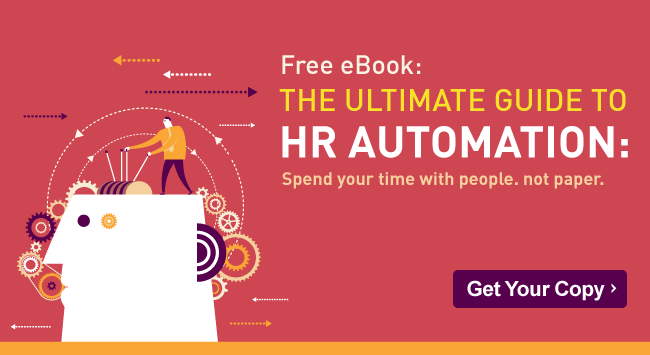 Download the ultimate guide to HR automation, which includes descriptions of automated HR tasks, interviews with experts in the field and much more.